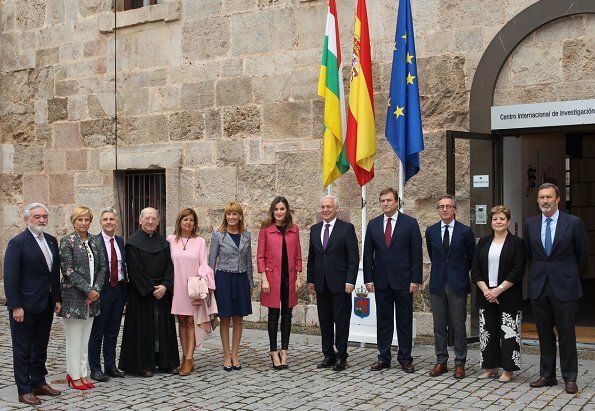 On May 29, 2018, Queen Letizia of Spain attended opening of the 13th International Seminar on Language and Journalism held at the Monastery of Yuso in San Millán de la Cogolla in La Rioja, Spain. Before the meeting, the Queen greeted the crowd that had gathered outside the Monastery of San Millán de Yuso. Very nice - love the punky red of the coat. Nice styling. Q Letizia and these leather leggins maybe she feels they make her feel or look younger than she really is.She is a beautiful very slender Lady she don't need to be insecure the coat seems to be for a much younger person too. Yesterday by the Romania visit she was spot on. Me gusta su manera de cumplir, el conjunto que lleva la sienta muy bien, me agrada. El de ayer tambien, era un acto diferente , un almuerzo , estaba muy elegante. Beautiful, stylish, modern! Love that a queen near 50 years of age wears leather pants (leggings). She looks wonderful with the big pink coat over the leather!! As long as it is done in taste, leather should not be determined by age and Letizia wears it well. She's only 45 years old. Agree, this outfit is a welcome change all in all she is looking stylish, modern and beautiful. I have been 45 and am now 50. 45 is near to 50 which is why I agree with the earlier post that it is good for Letizia that she can wear leather and look so fantastic, at any age. Eh bien, non, madame. 45 ans, c'est pas 50. Vous pouvez vous consoler comme vous préférez, mais ça ne convaincra personne: 45 = 45, point barre. This is Letizia's third engagement since returning from her packed trip to Haiti. She is one if the busiest and hardest working royals averaging at least 2-3 engagements each week. I appreciate all she does while almost always looking wonderful. I think it looks rather tacky. And it´s not a silhouette I find flattering. Leggings are sports wear in my world, and the combination with heels is jarring. Most of all though, I think she will regret this look later - it might be trendy to dress like that now, but it will not stand the test of time. Agree Vanessa. Tacky, too tight to be stylish. Anonymous @12:16, I disagree with your fashion opinion, however there are 2 things that I would love to mention. 1. Check your facts, Mary of Denmark has worn leather pants or leggings on more than one occasion, I would venture to say that they were almost exactly as the ones pictured here. You may want to look at some posts on this precise blog. 2. I will not entertain your agenda discussing the popularity of the Spanish queen, but I can guarantee that if such feelings exist in part of the population it's not because she wears high heels. Do you truly believe that people are so shallow as to judge the entire work of a public figure by the height of her shoes?. I would agree that the usual trolls do use that argument when they can't find anything else. Love the coat, fresh and original, I am not a fan of the leather pants, merely because they are are so over used that I think is time to move on, and because they make the outfit a little wintery, she could have improved the style with a slim pant, preferably grey or of the same tone of the coat, some chunky heels and voila!! The end result it's OK and somewhat forgettable. Jane Chantal, I don't know where you are from or your age, in Spain nowadays we are not so outdated... Our Queen doesn't wear gloves either..
Jane Chantal, your comment is not only vulgar, but incredibly juvenile. I am surprised that Ms. Electra won't delete comments in direct reference to a woman's private parts. Oh my!! I didn't understand properly!! Dear Cherry Blossom, I was actually using a rather discreet phrase that another commenter had used, the intention in both cases being to _avoid_ explicitly referring to a woman's private parts. I suspect that your indignation may have more to do with disagreeing with me about the appropriateness of Letizia's attire. When there is a difference of opinion about what someone is wearing, or about choice of words for that matter, we can "agree to disagree". Anonymous at 9:25, clearly there is a difference of opinion among those here on what is appropriate attire for a queen when she is carrying out an official engagement. We can "agree to disagree". Nope, you don't get a pass!! Your comment is unacceptable under any circumstances, not to mention the vulgarity. Your description is erroneous, I don't see any pictures on which I can see the private anatomy of the queen or even the model's, for that matter. You are entitled to use juvenile and salacious adjectives in your private conversations, and it seems like you are doing it here as well on a public forum, and as such, I raise my objection to your language on this space.Finally, Just so you know, this has nothing to do with a difference of opinion in fashion, I would never tell my daughter,sister, mom, friend or coworker that their pants were showing their " shrink-*^%#*" . Rude and unbecoming of an adult woman. She is stunning! How can you criticize someone who has impeccable taste, she knows what is appropriate for every occasion. She is so in touch with what is happening today. Those kids, I'm sure, loved how beautiful and accessible she was. 12C in La Rioja yesterday. Last October was warm. The weather is crazy, that's the point. She looks awesome. The coat covers most of the outfit and the black underpinning does not reveal too much. She also owns these pants in two other colors that we have seen, and they were worn with stilettos. Surely the'jarring' effect no longer exists. This seems more like an occasion to be a journalist among her international colleagues who may or may not live in monarchies, as opposed to an untouchable queen in haute couture and jewels. Context is everything. No es locutora, es periodista y reportera..Para ser locutor no hace falta estudios..
Además habla inglés, francés, catalán y un poco de alemán..
Anon: 12:58. Looking at the pictures, everyone is wearing a coat or jacket which tells us that the weather is not overly warm. Simple observation of the details in a picture can inform the viewer. The audience, the occasion, the weather, and the personal aesthetic of the person are all factors that should be taken into consideration. Not everything that looks good on one woman translates well to another. In addition, when compared to Letizia these women spare no expense, and have massive closets that are not repeated as often. Just a comment on wearing the very high stiletto shoes on the many cobblestone streets in Europe. They are an invitation to sprained ankles. And the woman in the pale pink dress in photo #1 would look a lot better in another type of shoe. Shoe styles these days leave much to be desired. I hate those pants! The would be fine on a teenage girl, but anyone whose age doesn't end with 'teen shouldn't be wearing those pants in my opinion, especially not a Queen. I hate to appear ageist, but those pants don't seem appropriate.